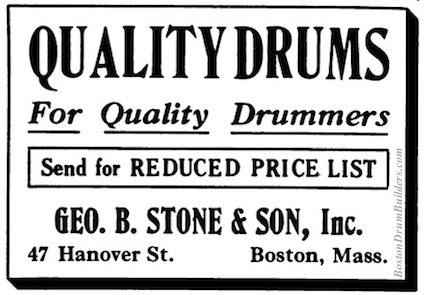 After months of running this rather generic, uninspired ad, a new one appears in June of 1922. It is likely no coincidence that this comes shortly after the hiring of Fred W. Neptune, formerly of J. C. Deagan, as Advertising Manager only one month earlier. Also notice that the company's address is listed here as 49 Hanover Street. 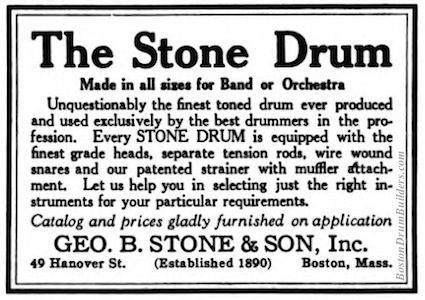 In July of 1922, the previous month's ad is adapted to include an image of the Stone Separate Tension Orchestra Drum but offers essentially the same information as before. Interestingly, the address of 47-49 Hanover street is now being used. 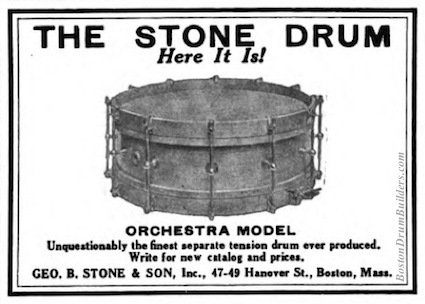 Most significantly of all is the advertisement appearing in September of 1922 where we see for the first time what is soon to become known as the Stone Master-Model Drum. 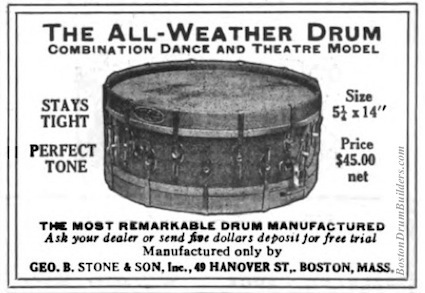 Apparently it was initially called the "All-Weather Drum" which didn't exactly have much of a ring to it. This ad was also run in October and November of 1922. Only the 49 Hanover Street address is listed now. 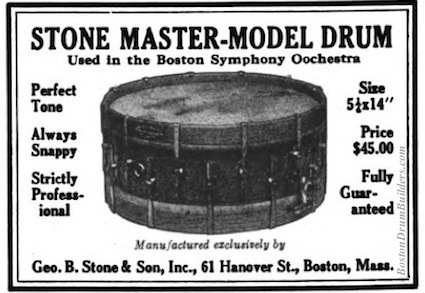 By November of 1922 the new drum is being referred to by Stone in other industry publications as the "Master-Model" and in December of that year the following advertisement runs in Jacobs' Band Monthly proclaiming that the "Stone Master-Model Drum" is "Used in the Boston Symphony Orchestra". Also note the change of address to 61 Hanover Street. Do you have a Stone Master-Model snare drum? I want to hear from you! Send Lee an email at lee@vinson.net.